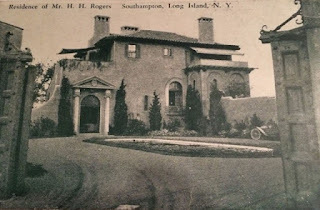 'Black Point', the Henry Huddleston Rogers estate designed by Walker & Gillette c. 1914 in Southampton. Click HERE, HERE and HERE for more on 'Black Point' which is no longer standing. It is reported that this property, including the building which formerly supported the windmill, is owned today by financier George Soros. Zach....any news on what might be happening to Idle Hour since Dowling closed.